If you’re reading this you’ll have noticed already that I decided to revamp the blog a bit. Don’t know why it never occurred to me before but suddenly, this afternoon, ‘Neil Schiller’s Writing Pages’ seemed like the shittest blog title ever. 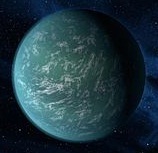 So I’ve renamed it ‘Twenty-Two B’ after the Kepler planet. The random stuff I stick on here is pretty much like visiting planet Schiller, so it seemed to fit somehow. Yeah, I think it’s a combination of having a bit of a confidence boost and getting some inspiration from other people. It certainly did me some good.